Console designed by KR+H's Paul Reidt and made by our craftspeople. Photography by Eric Roth for Design New England. 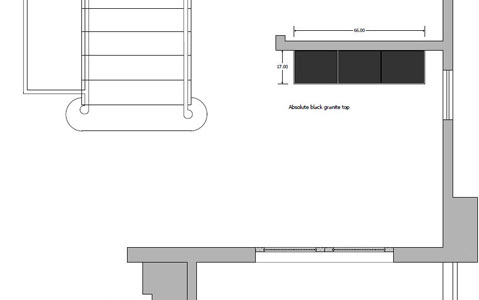 KR+H's plan drawing showing the position of the console in the entryway. 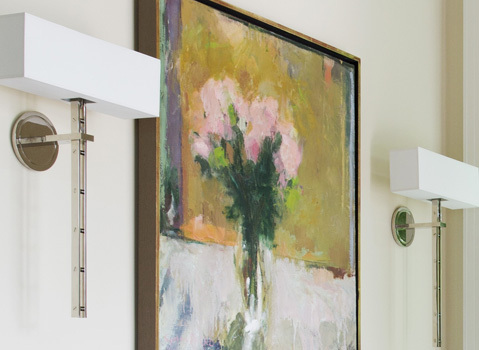 Paul told me, "The interior designer [Karen Quinn of West Cornwall, CT] had selected sconces that were so compelling because they were just a beautiful marriage of design and craftsmanship. I was just partnering up with those sconces. L'Orient Sconce that inspired Paul's design of the entryway's console. "After the console was designed they decided on different sconces. I think the sconces that influenced me were probably very expensive. It takes a long time to make nice stuff. The new ones do refer nicely to the design as well." The "Sheridan" sconces that replaced the original selection. The console (upper left) in "best of both views" in the current issue of Design New England. The wood selected for this console is sapele, an African wood that is in the mahogany family. The sapele for the console was quartersawn, which gives it a pomelle grain. It is said the pomelle sapele resembles rain drops falling on a pane of glass. Polished nickel highlights the sapele wood. The counter is absolute black granite. Close up of console showing detail of sapele wood. Paul's design and selected materials were brought to life by our amazingly skilled craftspeople. Beautiful design reflected by beautiful craftsmanship offers a vital story. This story of beauty and craftsmanship speaks to us today, has spoken to us through the ages, and will continue in the future to speak to us. An annual destination KR+H's Paul Reidt always looks forward to is the International Contemporary Furniture Fair in NYC. Visiting ICFF last week, Paul brought back the good news that this year's ICFF was "more vibrant with more exhibitors and with an air of optimism not present last year." As Interior Design magazine said in their online story, "If New York's 2014 design week happenings are any indicator, the industry is out of the red." There was, Paul noticed, a preponderance of lighting at ICFF..."evidence of the rich design environment for lighting now with advancements in LED technology." The New York Times writer Julie Lasky took note of the lighting as well in her article, "Grabbing the Spotlight." To read her fun article and see a great slide show of furniture and lighting at ICFF, click here. Lighting had the spotlight at ICFF. There were exhibits testifying to the fact that imaginations are still captivated by the machine age; and as Paul says, "American manufacturing when it was still completely sure of itself." Paul told me our friends at Amuneal Manufacturing Corp. had an exquisite booth. I then discovered online that Amuneal was awarded Best Booth at ICFF for the second year in a row. Amuneal is made up of innovative designers, engineers, fabricators, and fine artists. They fabricate designs by architects and designers as well as creating their own designs. l to r: Amanuel Manufacturing Corp. was awarded Best Booth at ICFF and their shelving system. 12th Avenue Iron, a company of ten metals artists and craftsmen, exhibited the Tom Kundig Collection. The architect Tom Kundig, Olson Kundig Architects, designed these pieces of hardware that were fabricated by 12th Avenue Iron. The Tom Kundig Collection exhibited by 12th Avenue Iron. After many inspiring hours of exploring ICFF, Paul hung his hat at the Refinery, a boutique hotel in the garment district. In the hotel's design, its gothic building's industrial past is remembered. Paul's room included a writing desk with a surface of distressed oak and a base reminiscent of an early 1900s sewing machine. The desk was designed and made by Get Back, Inc., creators of vintage American industrial furniture. 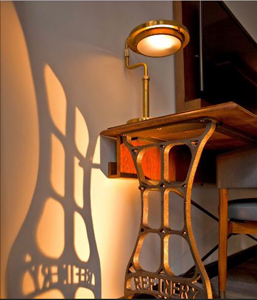 Writing desk by Get Back, Inc., in the Refinery Hotel, NYC.